Changes from 1.35 Beta 2: small optimizations. Well, as some of you may have noticed, in the last few days this topic was locked and I wasn't online. Another reason is: in the latest VMUB version the VBoxManage.exe job errors are rarely seen now (on my computer are 0% in XP/7/8.1, admin or normal user). The only condition is to be PROPERLY used. I'm sorry Steve, but your video tutorial for VMUB is now outdated. If you can't make a new one I will try to do it. But it will be with no sound because: my spoken english is terrible + for medical reasons my voice is not so good lately + my microphone is low quality. For now I will lock the topic again and I will stop improving VMUB. But I will come back sometimes to adapt it to the new VBox/QEMU versions and/or to fix serious bugs. Thank you those who helped making VMUB better, especially to Steve. It was adapted to the new VirtualBox 4.3.12 version. It seems they fixed the problem with the VirtualBox COM server (VBoxSVC.exe). So a new VBoxSVC session can be started without waiting for the previous to close. Also, they changed the environment variable "VBOX_INSTALL_PATH" to "VBOX_MSI_INSTALL_PATH". VMUB checks now for both when it starts. LE: source code removed, you can find newer version in the next posts. The Setup version says it;s 1.35 when I run it??? Sorry, wrong file, corrected. Thank you. 1. The state of the drives (plugged/unplugged/mounted/unmounted) is now constantly monitored and displayed in each entry (the drive column). This can be done also manually by choosing Refresh in the context menu or by pressing F5. 2. Added an option to list only USB drives or to list all drives. 3. It detects now the drive ID change inside the VM and automatically updates its entry. 4. Added option to set the list font. Edit: attachment removed, you can find the sources in the download section. The features implemented in the previous version were improved a bit. For example the drive detection is now faster and more accurate. Added an option to set if pressing the Escape key in the main window will close the application (default on). Thanks! Will test soon (sorry for not responding before). P.S. When you run the Setup installer, after install it tries to run the app and under Win8 (+UAC) gives an error due to no admin rights which may be disconcerting to some users. Can you make it run with Admin elevation at end of install? Might be good to add a post install Info window to tell the user it must be run with Admin rights. If you download the easy2boot MPI toolPack you can see VBS code to create Desktop shortcuts with Admin rights if the installer cannot do it. It doesn't seem Inno setup can create such shortcut or modify the exe properties directly (using its commands/functions). However the "Launch Virtual Machine USB Boot" option can start VMUB as admin only if the setup exe file was started as admin. So far I haven't found an workaround for this. This way it will start the exe as admin no matter where you move it. On my computer works fine. 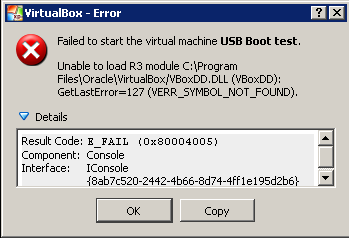 However the problem with "Launch Virtual Machine USB Boot" is still unsolved. There is a computer application which can create some special shortcuts. With such shortcuts you can open an application as admin but without the UAC prompt (even if UAC is on). Basically it will create a scheduled task (with "run as admin") and it will start it every time you use the shortcut. It's the only way to avoid that UAC prompt without deactivating the UAC. 2. it will not be focused. 3. the scheduled task needs to be changed every time you move the exe file in a different folder. 1. Drag'n'drop implemented in the main window, Options and the Add/Edit window. Unfortunately, when UAC is on, the application from where you drag the file/volume/drive needs to be started as administrator too (Windows limitation). 2. In Windows 7/8/8.1 you won't have to set it to "Run as administrator" because it will start as administrator by default. 3. Many small tweaks to the code and to the interface. That's why I released 1.42 RC1 in my previous post. 1. Drag'n'drop implemented in the main window, Options and the Add/Edit window. Small problem: when UAC is on, the application from where you drag the file/volume/drive needs to be started as administrator too (Windows limitation). 2. In Windows 7/8/8.1 you won't have to set it to "Run as administrator" because it will start as an administrator by default. 1. The USB stick/flash/card could not be removed while VMUB was started. Fixed. 2. The progressbar shown when waiting is now filling a little smoother. 3. In some rare situations it was waiting for VBox Com Server to close even if it was not necessary for that VBox version. Fixed. Better adaptation to the latest VirtualBox version. 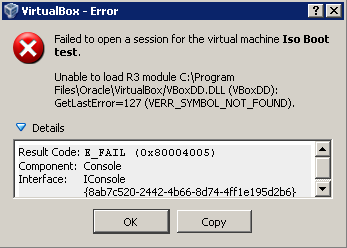 Strange, the new VirtualBox version (4.3.20, released yesterday), fails to start any VM in my Windows XP SP3. However, in Windows 7 x64, it loads fine any VM. Can anyone else confirm this...? Later edit: seems this problem appears when using some security solutions. For now I downgraded to 4.3.18 and I don't see errors anymore. 1. Added support for multiple translations. The language files can be stored in a Languages folder near the exe file (for the portable version), in Application Data folder for the installed version or in the resources of the exe file. They are in fact XML files and can be edited using any XML editor. If you want to help by translating VMUB into your language you can use the english.lng file as template. Just rename the file and translate only the text values (not the names). 2. Some of the resources from the exe file could of been accessed only by OSs with a few codepages. Now they can be accessed by OSs with any codepage. 3. The exe file size was reduced by compressing the large icons. 4. Few small tweaks and optimizations. LE: attached files removed, newer version in the next posts. What's changed: solved small bugs to the language code. LE: attached files removed, you can find newer versions in the next posts. Changes from 1.5 Beta 2: the language code is now much stable and it requires less size in the exe file. why upload you the sources not on GitHub ? first so many thanks for yr tool! apologize my very poor level and skill..
i've understood that yr tool was usable also with virtualbox -portable-..am i wrong..?? thanks so much again for yr kind patience!! so there is really NO WAY to use yr tool and able to add an usb drive to my VM..??.. Just send me a link to your version so I can test it and make the appropriate modifications to VMUB (if necessary)..."..
apologize me again and forever!! thanks so much for yr patience!! Edited by p060477, 07 January 2015 - 06:14 PM. 2. In the Add/Edit window the information about found disks is shown on columns (name/size/volume letter(s)). 3. Some small improvements to the language code. 4. Added german translation (lng file) sent by Blackcrack. For now is in the Languages folder near the exe (portable) file but in the final version all the lng files will be added in the exe file resources. LE: download links removed, you can find a better version in the next posts.